The truck goes vroom, kids get a kick out of the Truck Spring Rider. Designed with safety and convenience in mind, the Truck Spring Rider features rounded edges, handle bars and a low entry height, allowing hassle free use. 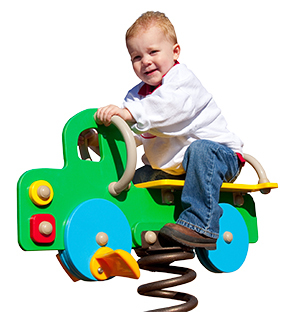 The colorful HDPE truck body easily catches the young ones attention and the spring coil creates the motion which takes the youngsters for the ride. Great for children ages 2 to 5, the Truck Spring Rider is a fun play component to enhance park or schools outdoor play structures.